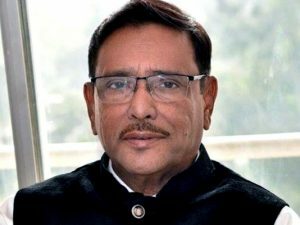 NOAKHALI; Awami League General Secretary Obaidul Quader yesterday said if attempts are directed to make the army questionable, the people will give a befitting reply to such deeds through ballots in the upcoming national election slated for December 30. “Bangladesh Army is our national asset and a partner of all developments. If anyone creates any situation to make the army questionable, the people will give a befitting reply to the concerned through ballots in the election,” he told an electioneering rally at Bangabandhu Sheikh Mujibur Rahman High School ground at Kabirhat upazila under his constituency. Pointing at BNP, the AL general secretary said BNP leaders and workers are now engaged in internal wrangles resorting to violent acts and turning to Awami League making false allegations against the party. He said keeping his own vehicle at home, BNP leader Moudud Ahmed came out of the streets on a rented vehicle and dubiously prompted the party leaders and workers to carry out the attack on his own vehicle. Following the self-styled attack Moudud brought allegations against the Awami League,” he said. Quader urged the Election Commission to investigate the incident to bring those involved with it to justice. He alerted party leaders and workers to remain alert so that they would not fall prey to any instigation of BNP and Oikyafront. The AL general secretary said the grand-alliance government materialized the electoral pledges promised before the previous election. The country has been witnessing a huge development in all sectors including food safety, education, health, information and communication technology, road transports and railways and social safety net, he added. He expressed his optimism that the people will cast their votes in favor of AL-led grand alliance candidates in the election for the continuation of the current development. District AL President and Subrana Char Upazila Parishad Chairman Principal Khairul Anam Selim, Kabirhat Upazila Parishad Chairman Kamrunnahar Sheuly, Upazila Awami League President Nurul Amin Rumi and General Secretary Jahirul Islam Raihan were present on the occasion, among others.